It’s been a busy week for me at work with long days and some time over the weekend spent in the office, which means less time for art…so, today is a “light” art day. The good news is that work is going well even though it’s busy–a win on all fronts and I have plans to spend more time in my studio tonight, so that’s good. It’s constructed with repurposed paper from bill envelopes for the background, washi tape, Golden fluid acrylics, tin foil, tissue paper, repurposed paint covered paper towels from my studio, a variety of adhesives, marker and a super fun library stamp. You know the ones that the librarian used to stamp the due date on the little card in the back of your book? Yeah, that kind. This week’s lesson has me thinking about how in order to bloom, the flower has to change. Since change scares the daylights out of me on most days, I created this piece to remind myself that without change there would be no blossoming. Being in bud form is safe and cozy, but it’s not the full expression of the flower without the process of opening and changing. A metaphor for life, no? 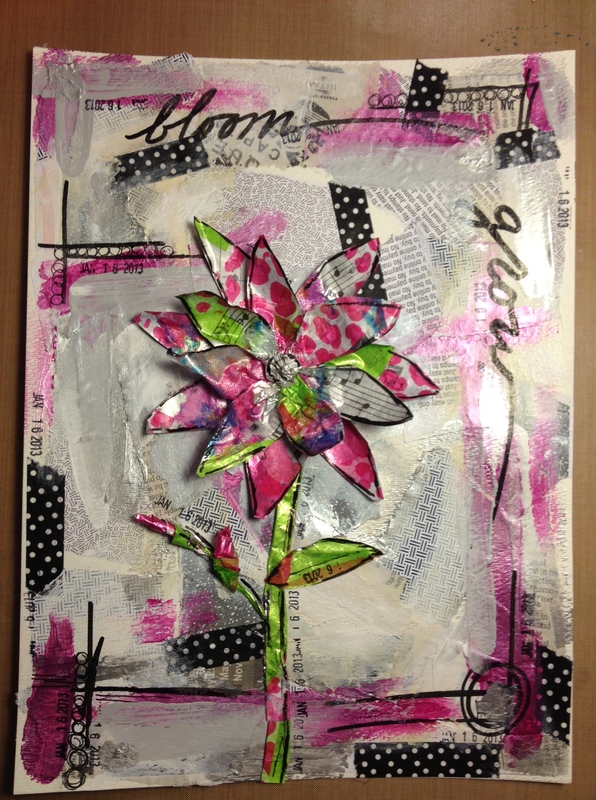 This entry was posted in LifeBook 2013, Mixed Media and tagged anais nin, blossom, change, christy tomlinson, grow, LifeBook 2013, mixed media. Bookmark the permalink.